Apple has just released iTunes 10.1.2 for download, the update is said to offer improved stability and performance in addition to improvements with AirPlay and iOS device syncing including the iPhone, iPad, and iPod touch. In other words, if you plan on getting the Verizon iPhone, you will need to install this iTunes update before you can use the phone with your computer. It is also worth pointing out that Apple specifically references the iPhone 4 as a “CDMA model” rather than specifying Verizon, this might suggest that the CDMA iPhone is coming to other CDMA compatible carriers soon around the world. 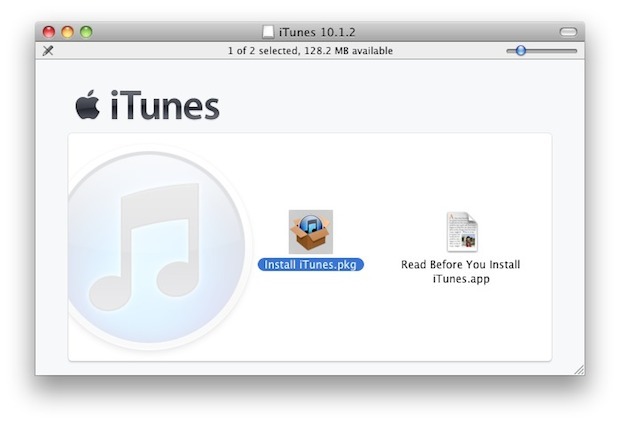 You can download iTunes 10.1.2 either directly from Apple or through Software Update. If you choose to get the download from Apple, you do not need to enter an email address, just click on the “Download Now” button and it will start without filling out the form. I think iOS 4.2.5 is Verizon only, it includes the hotspot before the official 4.3 release. I used the current 4.3 beta, it’s very buggy, not ready for prime time yet. We are a ways off on both, and a new iTunes will be out when it is. Visualizations still incredibly slow, but run at silky-smooth speed when you click on a menu … kind of annoying. i have an i pad 2.i have downloaded i tunes 5 from apple;s site but i am having trouble installing i tunes 5 on my pc(windows xp).it has a pop up during installation saying “there is a problem with this windows installer package.a program required for this install could not be run.contact your package vendor.please help.